Give us a call today to setup a reservation for your pet. Providing small carefully selected playgroups. 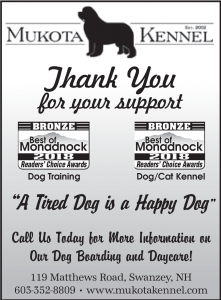 Mukota Kennel is a pet boarding kennel located just 1 mile outside of Keene, NH on 22 acres in Swanzey, New Hampshire. We offer Cat & Dog Boarding, Doggy Daycare, and Dog Training. Mukota Kennel is dedicated to the gentle approach of dog training, and the care and well-being of your pet is our utmost concern. Our reputation extends across the country, having received referrals from as far away as Alaska. We accommodate dogs & cats of all breeds, birds & exotics upon request. Our office is closed all major holidays (drop off and pick up).